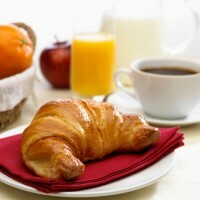 At Nuits Saint-Pierre, breakfast is not just a meal, it’s an experience of pure delight. Our motto: taste, nutrition, abundance. You will find freshly baked bread and « viennoiseries » (croissants and the like) and homemade pastries, as well as a more hearty dish: bacon and eggs, omelettes, “crêpes”, French toasts etc. We also serve a range of coffees selected for the richness of their aroma and a selection of fine teas: English Breakfast, Earl Grey, Darjeeling, green tea, etc. We serve a variety of teas (we use loose leaf only), chosen for their well-known qualities and delicate aromas. We offer more than 50 varieties of tea that you can sip in a cozy atmosphere that our patrons enjoy very much. All our teas are served in an individual 500ml white china teapot, which will give you ample time to savour this indulgence for a very reasonable price : between 3 and 5 euros depending on your tea selection. Among all the brands available, we chose Malongo and its single-shot vacuum-packed pods that guarantee total freshness and perfect aroma in every single cup. Exemplary in equitable trade and respect for small producers, Malongo has earned the Max Havelaar Fair Trade designation. Our coffee selection is quite large, from Blue Mountain, king of coffees, to a Grande Réserve blend, a mix of Arabica beans, a Haïti Guatemala, a decaffeinated coffee or La Tierra coffee, our favourite. And for a treat, why not try a Capuccino or Mochachino? There is lots of chocolate in our cake selection but we also offer hot chocolate, a delicious drink that can be singularly comforting in our climate! A hot chocolate made the old-fashioned way (not a drop of water is used) with 100% cacao. Powerful and restorative, it is quite “morish”! It all started with an orange pound cake that I made when I was 7 or 8 years old. it is my oldest memory of baking. It gave birth to my enduring passion for baking. I like to describe what I do as « cakes » rather than « pastries », a word I find too academic and pompous to describe my own creations. My cakes are easy-going and do not take themselves too seriously. I only use ingredients that are readily available at any grocery store. There is no mass production. I use no powder, margarine or preservatives. Butter, eggs, flour are some of the real ingredients I use: no substitutes ever.